Using proportional relationships to solve multistep ratio and percent problems. Drawing inferences about a population from a random sample of data. Making and stating assumptions based on real-life situations. 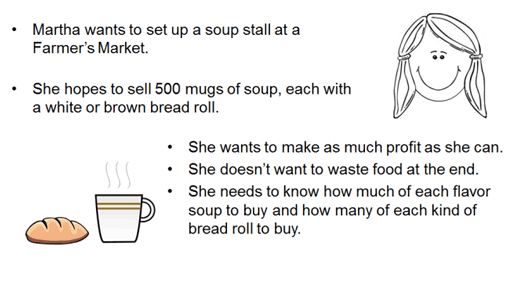 Before the lesson, students attempt the Selling Soup task individually. You review their solutions and formulate questions that will help students to improve their work. At the start of the lesson, students respond individually to the questions set. In groups, students combine their thinking and work together to produce a collaborative solution in the form of a poster. In the same small groups, students evaluate and comment on some sample responses. They evaluate these responses and compare them with their own work. In a whole-class discussion, students explain and compare solution strategies. Each student will need a copy of the task sheet, Selling Soup, pages 1 to 4 of Responses to Martha’s Survey, some plain paper to work on, a copy of the How Did You Work? questionnaire, a mini-whiteboard, pen, and an eraser. Each small group of students will need a sheet of poster paper, a marker, and copies of the Sample Responses to Discuss. Provide calculators for students who choose to use them. 20 minutes before the lesson and a 120-minute lesson (or two 60-minute lessons). Timings are approximate. Exact timings will depend on the needs of your class.